Updated May 22, 2017 – Updated for new AWS prompts. Fixed issues with static files. We all know Amazon Web Services frequently changes and updates their products and services. This post was originally written when all of the tutorials online for deploying Django to Elastic Beanstalk with PostgreSQL were outdated (using Python 2.7 and Django 1.7). There’s a few things that are different when deploying Python 3 to EB that weren’t widely known at the time. This tutorial is designed to help you easily deploy your web app. I’ve borrowed a few general ideas from here for this tutorial. As always, you can always check out the official documentation for the most up to date information. I did this on a Mac running macOS Sierra 10.12.5. It should be the same on Linux. Sorry Windows users, you’ll have to adapt this tutorial to your needs, but I imagine it’d be very similar once you get your Python environment set up. In this tutorial I expect that you already have an Amazon Web Services account and are familiar with it’s basic functionality. This goes over basics of creating a virtual environment and creating a Django app. If you already have this done, you can skip this part. Note: To deactivate your virtualenv just type deactivate at your command prompt. Install your dependencies with pip. We’ll definitely need psycopg2. If you have any other pip dependencies. Install them now. We’ll also create a new homepage app. Add the homepage app to the list of INSTALLED_APPS in your settings.py file. Migrate your database and run the server to make sure everything is working. git commit -m "Initial commit message"
Elastic Beanstalk will upload your latest commit to the instance. Make sure you always commit your changes before deploying your your web app to Elastic Beanstalk. Otherwise you’ll deploy old versions of your web app to the server. This will install awsebcli and a host of dependencies. The package awsebcli, or EB Command Line Interface (CLI), is a tool that helps you deploy and manage your AWS Elastic Beanstalk applications and environments. It also provides integration with Git. You can view more info here. This package is currently at version 3.10.1 as of this writing. Now we’re ready to proceed! 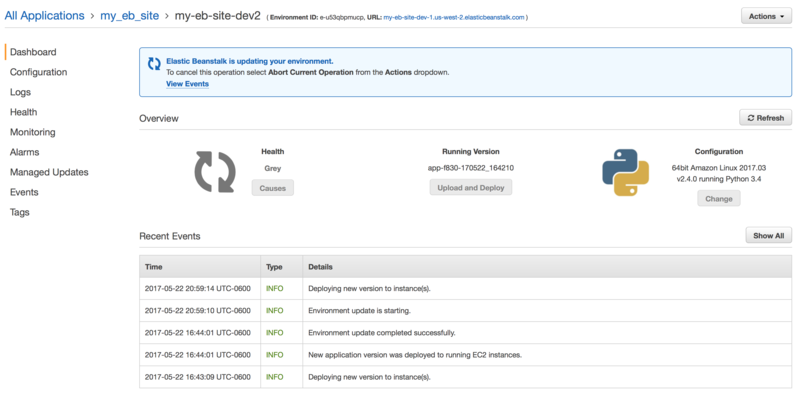 This will bring up a menu asking you to select which AWS data center you want your web app to be stored in. I chose option 3, US Oregon region. If you haven’t set up the AWS CLI, the next prompt will ask you to put in your Amazon Access ID and Security Key for your account or IAM user. If you DON’T get prompted to input these credentials, you probably already have these set up and you can move on to the next section. If you DO get prompted for these credentials, follow the directions in the next section. Let’s create a user specifically for our Elastic Beanstalk deployment. Visit the AWS IAM website here. On the sidebar, click Users. Hit the Add User button. Enter a name for the user and check Programmatic Access and hit Next. Hit the option for Attach existing policies directly. For purposes of this exercise, give the user AmazonEC2FullAccess, AmazonS3FullAccess, and AWSElasticBeanstalkFullAccess. You’ll want to refine these permissions for a production environment. When you finish creating the user, make sure you download the CSV with your Access Keys! Once you hit close, you will no longer be able to access the secret key and there is no way to recover it! Make sure you keep your keys safe. 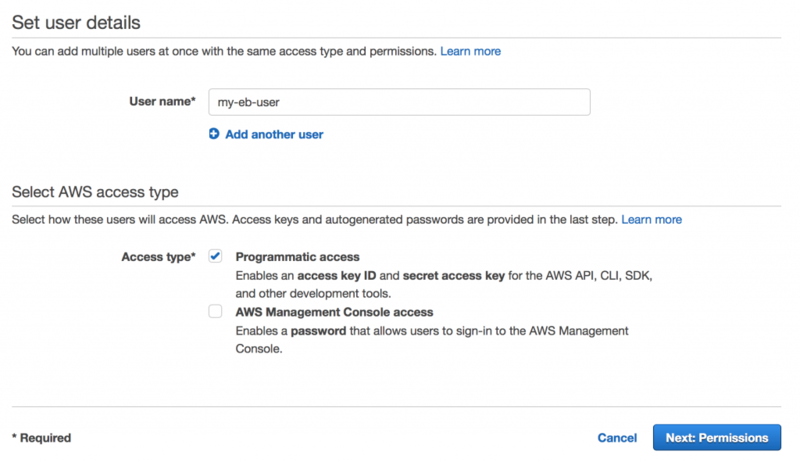 Anyone with these keys can access resources in your AWS account. When you’re finished, input these keys into the the terminal prompts for the EB CLI. You shouldn’t need to input these keys again in the CLI, but keep them for your records. The next part of the eb init script has us create a new application. You may not see this exact screen because I already have another app. I’m going to choose option 2 to create a new application. Application my_eb_site has been created. The next part of the script asks you for an Application Name (will be auto populated if you leave it blank), asks you if you’re using Python, and then asks which version of Python you want to use. Since I’m using Python 3, I will choose option 1 (If you’re using a version of Python newer than 3.4, you should be okay as long as you don’t use any syntax that’s specific to 3.5+ in your web app). It appears you are using Python. Is this correct? Next, you’ll be asked if you want to use AWS CodeCommit. We aren’t using CodeCommit so let’s say no. You will then be asked if you want to enable SSH. In my case, I’d like to have SSH for troubleshooting reasons. Do you want to set up SSH for your instances? This will ask you to create a new key pair or use a previously existing one. I'm going to use a previously existing one. After this, we are almost ready to have the EB CLI deploy our code. There's still a couple more configuration items that we need to address. Now before we use eb to create our instance in the cloud, we need to make some additional configuration settings. You'll need to adjust where it says "my_eb_site" to whatever you named your Django project. We're almost ready to go! We need to change a couple more settings in our Django project in order for us to get this instance created. Since we want to create an RDS instance with an EC2 instance on Elastic Beanstalk, we need to put the RDS database settings into our settings.py file. Luckily, EB has some global python variables that we can put into our settings that make it pretty easy. We'll put this code in an if-else statement so our database environment will still work on our development machine. Feel free to adjust your local environment to the required settings. We'll also want to make sure our models files migrate when we start our instance. In order to do this we'll need to add another few lines to our .ebextensions/python.config file. While we're at it, we probably want to collect our static files for our Django project. You'll add this underneath the container_commands. command: "python manage.py collectstatic --noinput"
We'll need to add a STATIC_ROOT variable to our settings.py file as well. You can add this near the STATIC_URL variable. The STATIC_ROOT variable tells Django to place static files in our app's directory under www/static. We reference this in the python.config by adding the StaticFiles: "/static/=www/static/" line. This line tells Elastic Beanstalk to create an alias in the Apache configuration to map the /static URL to our app's directory/www/static. The leader_only flag is optional. As noted here, it only runs the command on a single instance chosen by Elastic Beanstalk. Leader-only container commands are run before other container commands. A command can be leader-only or have a test, but not both (leader_only takes precedence). We only want to migrate our database once. So let's leave the leader_only flag set for that command. git commit -m "Added EB database config and requirements files"
Now that we've gotten everything ready, let's deploy our instance! This can be done with the eb create command. This command has default settings of auto scaling and no database. The auto scaling group defaults to 1 instance with a max of 4. If you don't want to scale out, you can adjust your application settings on the Elastic Beanstalk main page, or we can add --scale 1 flags to our create command. This tells EB that we only want 1 instance of our web app regardless of load. This also means that if our instance goes down, the ASG will automatically start another instance. Alternatively, we can specify --single to ensure we only have a single EC2 instance for our Elastic Beanstalk app that doesn't spin up anything else once that instance dies. When you run this command you'll get a couple prompts asking you to name your environment and choose a CNAME record for your subdomain at elasticbeanstalk.com. If the CNAME is taken, you'll be asked to choose a different one. That cname is not available. Please choose another. I won't go into details about the differences between classic and application load balancers in this article, but you can read more about them here. For let's go with the default option (classic load balancer). The next prompt that shows up is for database creation. You'll choose a root database user and password. Creating application version archive "app-db8b-170522_131626". Uploading my_eb_site/app-db8b-170522_131626.zip to S3. This may take a while. 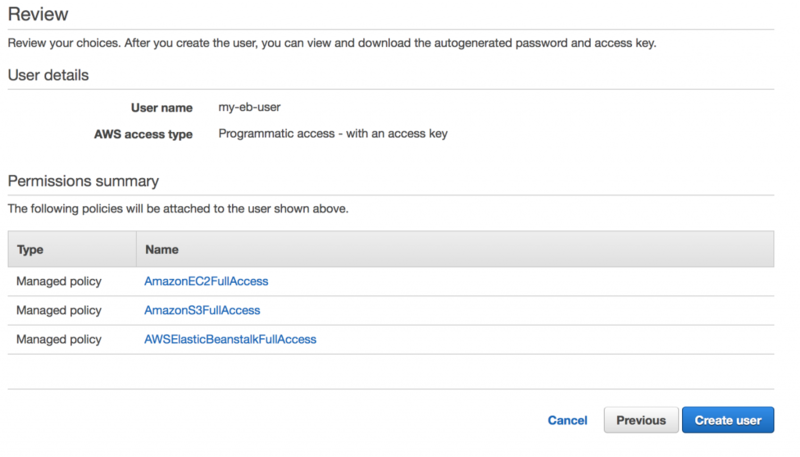 INFO: Using elasticbeanstalk-us-west-2-842337631775 as Amazon S3 storage bucket for environment data. That's not what we expected, right? This is a Django specific error that we'll learn how to fix this in the next section. Each time you make changes to your code, you'll need to commit those changes with git. If changes are not committed, they won't be pushed to Elastic Beanstalk. git commit -m "Added my site to allowed hosts in Django"
After a couple minutes, our changes should be shown on our live site URL. Thankfully deploying code is much faster than provisioning the whole infrastructure again! When we deploy our web app, our database is empty. What if our app has login capabilities? How are we supposed to login if we don't have any users? We can't use Django Admin's default createsuperuser command because it requires input in order to specify a password.This can be resolved by adding a create super user command to our Django app. To do this, we'll need to write custom django-admin commands. I'm assuming that you've kept the Django admin app enabled from when we created the Django app. As always, adjust this according to your needs. The next thing you'll need to do is edit your .ebextensions/python.config file and add the following lines underneath your container_commands section. Commit these changes and deploy them and you should be good to go! git commit -m "Added superuser creation"
Try logging into your Django admin page by going to your Elastic Beanstalk URL/admin (For example: https://my-eb-site-dev.us-west-2.elasticbeanstalk.com/admin/). Congratulations! You've just deployed your Django web app to AWS Elastic Beanstalk and RDS with Python 3, Django, and PostgreSQL! This post is featured on the 1Strategy blog. 1Strategy is a close partner AWS that helps companies develop and use cloud computing solutions. In business, information is crucial for making smart decisions. Most businesses require some type of centralized storage system. Paper logs, filing cabinets, or computer databases are all common types of systems to store business data. Computer databases and servers are becoming more and more popular even in small businesses. The need for computer servers in business is growing; however, choosing a server and a server operating system can be difficult to do. Linux servers provide excellent performance for a low cost. 2. Which Linux distribution is right for me? 3. How much will a Linux server cost? Linux is a clone of the operating system Unix, written from scratch by Linus Torvalds with assistance from a loosely-knit team of hackers across the Net. It aims towards POSIX and Single UNIX Specification compliance. server software, which are both open source. Along with Apache and Nginx, a variety of database back ends are used, namely PostgreSQL and MySQL.6 Figure 1 shows the percentage of Unix/Linux servers running websites today. 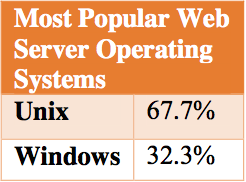 Unix/Linux servers power about two-thirds of all websites on the web today. Which Linux distribution is right for me? Flavors. Linux has a variety of “flavors” to choose from. Each distribution has different areas of focus. With so many different options, it can be hard to choose the right one. 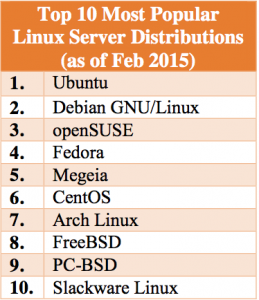 Figure 2 lists the top ten Linux server distributions available today. Each of the Linux distributions described in the Figure 2 has a specific purpose. Some work better in certain areas than others. For general server purposes (i.e., hosting a website, database, etc.) almost any distribution will work well. How much will a Linux server cost? Linux can cost as little as nothing or up to a few thousand dollars a year. Depending on the usage situation, Linux can be a cheaper alternative to Windows Server. Overall Linux provides great solutions for businesses and IT professionals. The OS has a long history of reliability and performance. Linux can be used to fill virtually any server roll with any one of the many OS distribution available. With such low costs, Linux is a great choice for any business. 1. “The Open Source Definition.” The Open Source Initiative. Accessed February 26, 2015. https://opensource.org/osd. 2. Linus Torvalds. “Torvalds/linux.” GitHub. October 28, 2012. Accessed February 26, 2015. https://github.com/torvalds/linux. 3. Brian Proffitt. “What Is Linux: An Overview of the Linux Operating System.” Linux.com. April 3, 2009. Accessed February 26, 2015. https://www.linux.com/learn/new-user- guides/376. 4. Przemyslaw Chmielecki. “Linux Myth. Open Source Software in Information Society.” Varazdin Development and Entrepreneurship Agency (VADEA), Oct 24, 2014. Accessed February 25, 2015. https://search.proquest.com/docview/1621414 396?accountid=4488. 6. “August 2013 Web Server Survey.” Netcraft. August 9, 2013. Accessed February 26, 2015. https://news.netcraft.com/archives/2013/08/09/august-2013-web- server-survey.html. 7. “W3Techs – World Wide Web Technology Surveys.” W3Techs. Accessed March 3, 2015. https://w3techs.com. 8. Avishek Kumar. “30 Big Companies and Devices Running on GNU/Linux.” Tecmint Linux. February 24, 2014. Accessed March 3, 2015. https://www.tecmint.com/big-companies- and-devices-running-on-gnulinux/. 9. Hess Katherine. “The Top 10 Linux Server Distributions.” ServerWatch.com. August 26, 2010. 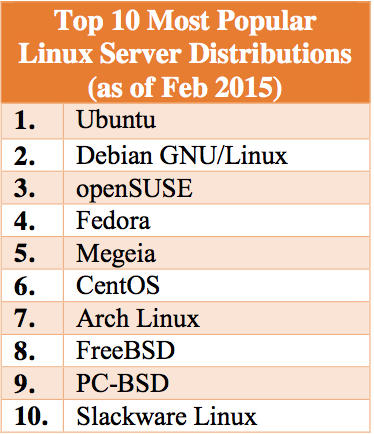 Accessed March 3, 2015. https://www.serverwatch.com/columns/article.php /3900711/The-Top-10-Linux-Server-Distributions.htm. 10. “Search Distributions.” DistroWatch.com. Accessed February 26, 2015. https://distrowatch.com/search.php?category=Server. 12. “Red Hat Store.” Redhat.com. Accessed February 26, 2015. https://www.redhat.com/wapps/store/catalog.html. 14. “Savings Using Linux over Windows.” 2X. Accessed March 3, 2015. https://www.2x.com/learn/whitepapers/savings- using-linux/. This disappeared off this blog earlier this month, so I thought I’d repost it here. I take no credit for any of this. If you’re like me, you’ve wanted to customize an Ubuntu install DVD for a long time – but all the tools/directions for doing it are out of date and/or broken. Look no further! I have successfully customized an ISO of Xubuntu 14.04 for my project Builduntu but this guide should work for just about any flavor of Ubuntu, maybe even other Linux distributions. If you aren’t sure, give it a try! Mint and Debian are very similar and may work with minimal changes to the commands (ie, replace apt-get with whatever package manager the particular distro uses). It helps if the distro you want to customize is the same as what you are running currently, but is not necessary. First download the ISO you’d like to start customizing from Ubuntu’s release server here. Remember where you save it, because you’re going to have to move it in a minute. From here on out, it’s bash command line. Don’t worry, it’s the easiest way of doing this (for now). You don’t need to be a Linux guru, just pay close attention to the directions and it will work fine. Create a fresh folder to begin work. For the purposes of this guide, everything will be done from the starting point of the user’s home directory (indicated in Linux by a tilde “~”). Approximately 10 gigabytes total of free hard drive space is required for decompressing the ISO filesystem and repackaging it at the end. Next, extract the contents of disc image. You’re going to need network access from within the chroot environment to download and install updated/new packages. Essentially what’s happening is you are going to “log in” to a command line instance of the Ubuntu installation, separate from the host system. Perhaps a confusing concept to wrap your head around at first, but it makes sense when you think about it. Copy resolv.conf from your system into the freshly unpacked fs. Now you are actually logged in to the installation instance as root. Neat. Before making changes, a few commands will make sure that everything goes smoothly while modifying packages. OK, now you can start playing around. This guide is only going to cover adding and removing software, but it’s possible to customize just about anything. Things like custom backgrounds and settings are already documented elsewhere, but be careful! Many of the directions are outdated and the commands may need slight alterations to work correctly. I had to piece this guide together from a few different sources with a whole lot of dead reckoning. Start by removing the packages you don’t want. Be sure to use the “purge” command so that the system will automatically uninstall and delete the package, which optimizes the space required for the ISO. When you execute purge, read the list of programs to be removed before you select “Y” and make absolutely sure you haven’t accidentally flagged a core system package via association.You will recognize this because the list will contain significantly more packages than those you selected. I personally remove games, scanning utilities (I don’t have a scanner) and default text editors like abiword and mousepad (geany is the best). Stay away from core components unless you know what you are doing. Since I am customizing a 64-bit Ubuntu image, I need multiarch (i386) support for some of the programming libraries. The following command is not necessary for everyone, but I recommend it anyway. Update the software repositories and upgrade the remaining packages on the system. You have now “logged out” of the installation environment and are “back” on the host system. These final steps will actually produce the ISO. Other guides stop working at this point, but have no fear! The following commands have been tested and verified. (Note: You may need to be logged in as root to run the above command. I kept getting a permission denied error with only using the sudo). sudo mkisofs -D -r -V "$IMAGE_NAME" -cache-inodes -J -l -b isolinux/isolinux.bin -c isolinux/boot.cat -no-emul-boot -boot-load-size 4 -boot-info-table -o ../name-of-your-custom-image.iso . Have fun and good luck! Let me know how customizing works out for you!